To kick off the semester, the C. T. Bauer College of Business will host several events focusing on professional development, recruitment volunteering and more. Several Bauer College units are hosting events to kick off the fall semester, focusing on professional development, recruitment, volunteering and more. The list below represents just a few upcoming events open to Bauer students. For updates on additional Bauer events throughout the semester, click here. This open event allows Bauer College students to learn how they can develop their leadership skills through the college’s Leadership Initiatives. Attendees will also learn in a workshop on leadership from Deloitte, LLC, partner Tom Daley. 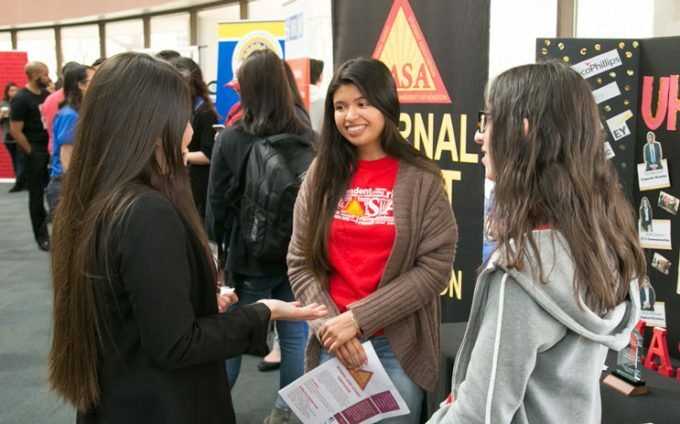 Representatives from Bauer College’s 25 student organizations will share their missions with potential new members during this three-day event. Hosted by Bauer College’s Rockwell Career Center, local organizations and retailers will be on campus to share with students tips on professional dress for upcoming networking opportunities as well as internship and job interviews. Students can visit with academic advisors from Bauer College’s Office of Undergraduate Business Programs without an appointment at this two-day event designed to prepare BBAs who anticipate graduating this semester with a plan to complete their degree programs. Exclusively for Bauer students, the Fall 2018 Business Career Fair brings recruiters from more than 100 businesses to campus looking for candidates for full-time and part-time positions as well as internships. Hosted by Bauer’s Rockwell Career Center, this event includes employers from a range of sectors, including IT, finance, sales, entrepreneurship, management, supply chain management and more. Students are encouraged to register early.